It was almost an unbelievable scenario, but when Leyland Australia was in its death throes as a vehicle manufacturer, thanks largely to the failure of the P76 to generate sufficient return on investment, the Product Team continued to work on what can only be called, a folly - the Force 7 coupe. New to the editorial team at MODERN MOTOR magazine it was my job to dig up some news on the car, and report on the latest testing. 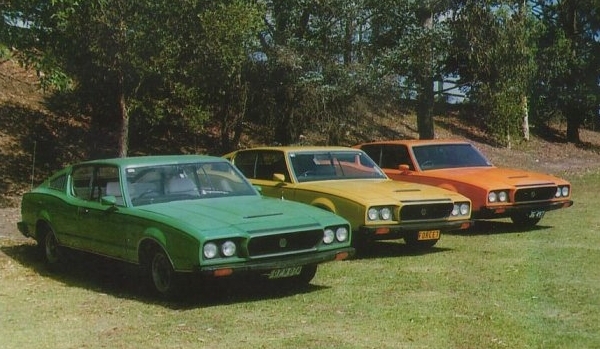 The Leyland Australia engineers were a pretty canny bunch when it came to hiding their work from prying eyes, but at MODERN MOTOR we were also a pretty crack team at infiltrating security, and snapping sneaky photos. The editor at the time, Rob Luck, had a very switched-on network of informers, and amateur scoop photographers, and he himself had been known at times to find himself ‘inside the fence’. Turns out he was a part time Ranger at the Royal National Park, south of Sydney. For the past few weeks he had been on duty collecting entry fees at the main gate, and religiously every morning at 7am, an orange Force 7 coupe entered the park, with a Marina chase car right behind it. It was pretty easy to hide off the road, near the entry gate, and snap a few photos with a long lens over a period of three days. Then we would drive south on the Princes Highway, and enter the Park from its southern gate, and set up on some twisty bits where the cars would have to slow down, and that gave us some driving shots as it exited the Park. Sadly, while the scoop was newsworthy and well documented the end was fast approaching. In 1974 Chairman David Abell announced manufacturing had ceased, and the company would revert to the status of an importer. The Force 7 was stillborn, and several in-process cars were crushed, leaving just 10 finished cars to represent the futile efforts of the Product Team. 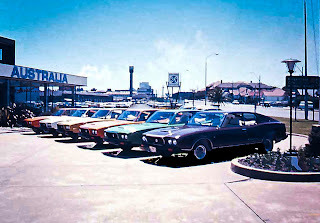 I’m indebted to my friend John Shingleton for this hastily-snapped photo of six of the last coupes, parked out front of the Leyland Australia head office, just before they were auctioned. 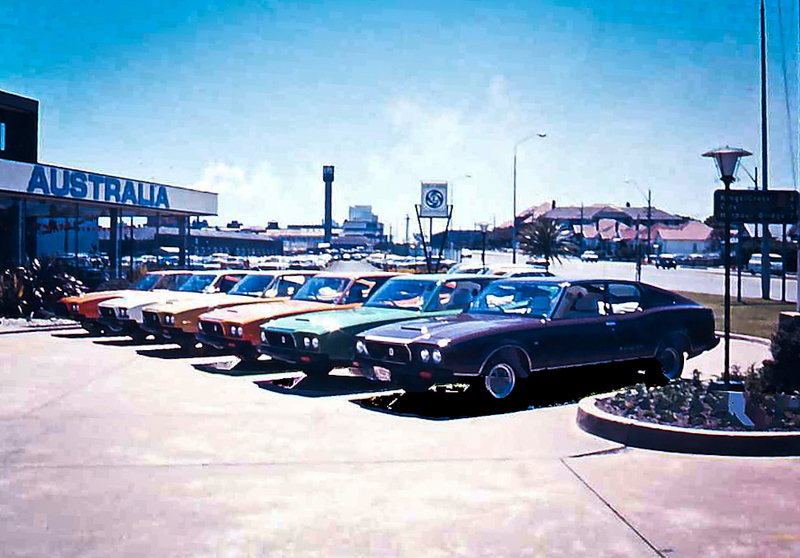 John had been asked to meet with management to set up parts supply from the UK for the Triumph Dolomites which were soon to be imported, and as he arrived for his meeting he managed to snap off this one photo on a half-frame camera he always carried with him. Now, there are plenty of photos available of some of the last cars, which ended up in the hands of enthusiasts, or more precisely, ‘Force 7 Tragics’. 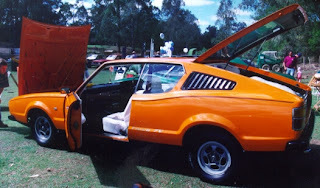 It was the biggest hatchback most of us had ever seen, and whilst it wasn’t exactly beautiful its lines were easier on the eye than the P76 sedan. 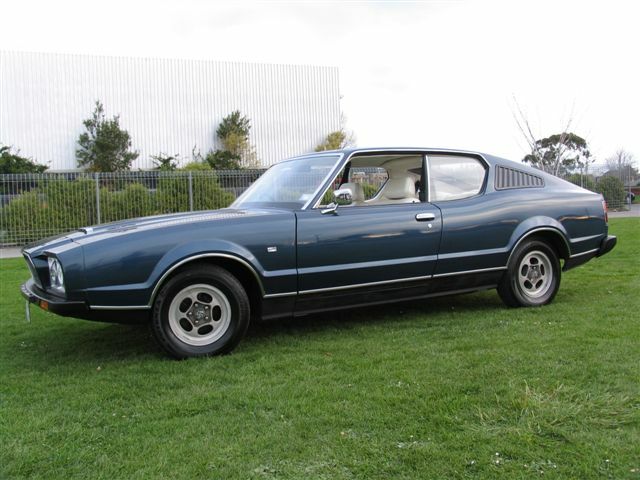 Like the sedan, it was initially designed by Giovanni Michelotti, however more of the original Italian Force 7 sketch survived into production than did the sedan. 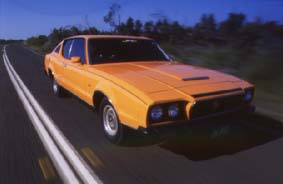 There’s a great story that when Michelotti saw what the Australian design team had done to his original drawings to produce the final production P76, he packed up the quarter scale P76 model, and all the drawings and sent them to Australia saying he did not want his name associated with this ‘abomination’. The P76/Force 7 was a brave, foolhardy, move by a tiny company, with a tiny budget and not a great grip on reality. It truly was a folly, but parts of it were brilliant. I drove a Force 7 for half a day, before the auction – and the team had done a good job of refining it. The aluminium V8 engine in particular was world class, the ride and handling were impressive and the styling (whilst controversial) was completely different to the American offerings from Holden and Ford. Would the Force 7 have been popular if it had survived? Given the mediocre response to the P76 sedan, I’m not sure either would have survived for long, but I think the Force 7 would have attracted a lot of interest. It was new, different, edgy and appealing - but would that have been enough?